This queen sacrifice is a typical way of maximizing the power of a rook and bishop working together on the black squares. 34.Qxg6+! 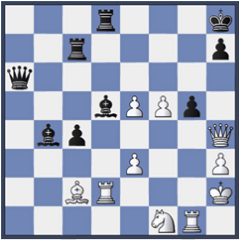 (Deflecting the pawn if 34...hxg6 35.Rh8 # Rg7 35.Rxh7 1–0Black resigned. Susan was leading our Hungarian teenage team to winning the Gold Medal. This game was played in one of the most decisive matches against the Chinese team. Black’s last move was tricky, hoping for 38.Qxg5 Rg8 attacking both queen and rook. But white’s reply is trickier. 38.Rxd5! 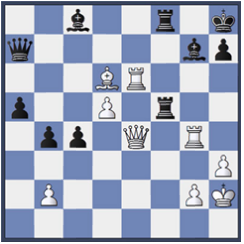 The queen can’t be captured, due to back rank mate (38...gxh4 39.Rxd8#) 38...Rxd5 39.Qxg5 1–0 Black resigned, since the rook can’t get back to the defense of Qg8# (39...Rd8 40.Qxd8#) and g7 squares from mate. This game was played in one of Susan’s most memorable tournaments. 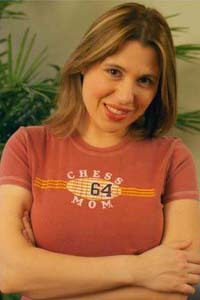 By fulfilling her third grandmaster norm, she became the first woman to earn the highest possible title in chess. Susan is a great team player. She went on to win ten Olympic medals (5 Gold, 4 Silver and 1 Bronze). Her most recent Olympic spotlight moment took place in October 2004, when she and the U.S. women’s national team brought home the first ever (silver) medal for the United States at the 36th Chess Olympiad. In that Olympiad, she further distinguished herself by bringing home 2 additional gold medals. This combination is not about giving mate. It is "just" about winning a piece. However, at this level of play it’s enough to win the game. Another nice game from the 1988 Olympiad. A fine example of a well played KID (King’s Indian Defense). 24...Nxg2! (If the king takes, Be1+ wins the queen with discovered check.) 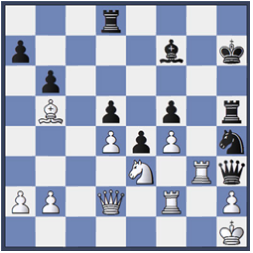 25.Qxg2 Qh4 There’s too much pressure on the h3 pawn, the white square Bishop will finally make a big appearance there. 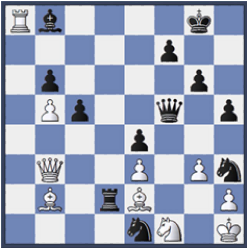 26.Kg1 Bxh3 27.Qh1 Rf6 Bringing more pieces in the attack. 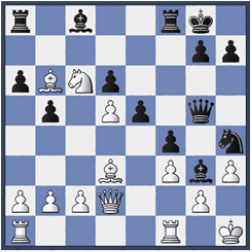 28.Bd8 Rxd8 No need for this rook, the pieces on the kingside will finish the job. 29.Nxd8 Rh6 30.Ne6 Qe7 0–1 Black now threatens to capture the knight with Bxe6 with a discovered attack. If the knight moves, the queen can get back to Qg5 and white will get checkmated. White resigned. Lajos Portisch was the best Hungarian player for decades and one of the strongest GMs in the world. As kids we used to study from his books. This combination is one of Susan's favorites in all of her games. A great demonstration of tricky knights at their best! 36...Qxf1+! Opening up the 2nd rank and removing a key defender piece. 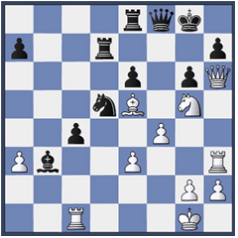 37.Bxf1 Nf2+ 38.Kg1 Nf3+ 0–1 White resigned, since there is no way to stop the mate. 39.Kg2 Ng4+ 40.Be2 Rxe2+ with mate on Rf2 or Rxh2 next.